The Greensboro Rotary/Angel Flight team, supported by the club’s Foundation which covers fuel used to fly its missions, continues to volunteer in helping fly cancer patients, burn survivor children, tumor patients, organ donors, transplant patients, and others dealing with serious medical issues. 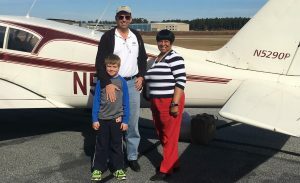 Recently, one of our Rotary/Angel Flight team pilots, Ray Burton, accompanied by his eight-year-old son, flew a patient from her home in Goldsboro to Atlanta and back, where she is receiving special treatment for cancer. She is very grateful to Greensboro Rotary and Angel Flight for the round trip air transportation assistance we provided at no cost – which would have normally been an uncomfortable seven-hour drive for her each way. Donations from the Greensboro Rotary Club Foundation are used by our volunteer pilot team to provide the fuel for their private planes used on Angel Flight missions, enabling them to aid people in need through our club’s support and community service. The flights by Greensboro Rotary’s pilots benefit chronically ill children, adults, and active and veteran military personnel by making available free air transportation to/from their specialized medical appointments and for reasons of compassion.